UPDATED on August 2017 – How much does it cost to travel in Thailand? It all depends on your travel budget and taste! It can be really cheap if you are willing to do it on a low profile, like backpacking around Thailand. Or very expensive if you choose the best of the best! For us, who have been traveling around the world for more than 3 years, Thailand is one of the cheapest country we visited! Our nomadic life across the globe is based on fun, adventures, amazing beaches, delicious food and a well-organised travel budget. We try to spend our money wisely, making the most of our travel budget. It means that sometimes we cut costs and other times we splurge a lot. How much does it cost to travel in Thailand is part of our series of posts about the cost of travelling and living abroad. 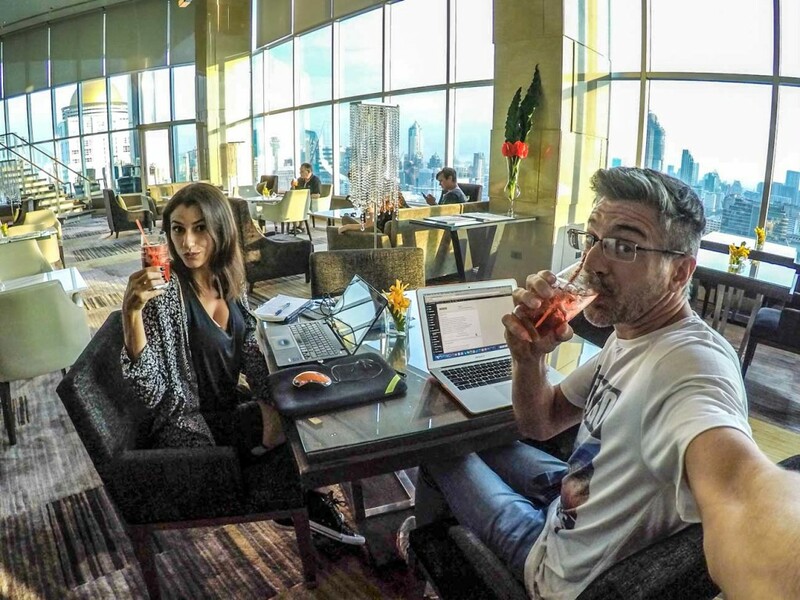 On the blog, you find our travel budget breakdown from Portugal, Philippines, Spain, 6 months traveling the world, one year as digital nomads and 2 years traveling the world. Feel free to browse around and follow our best tips to organize your budget. 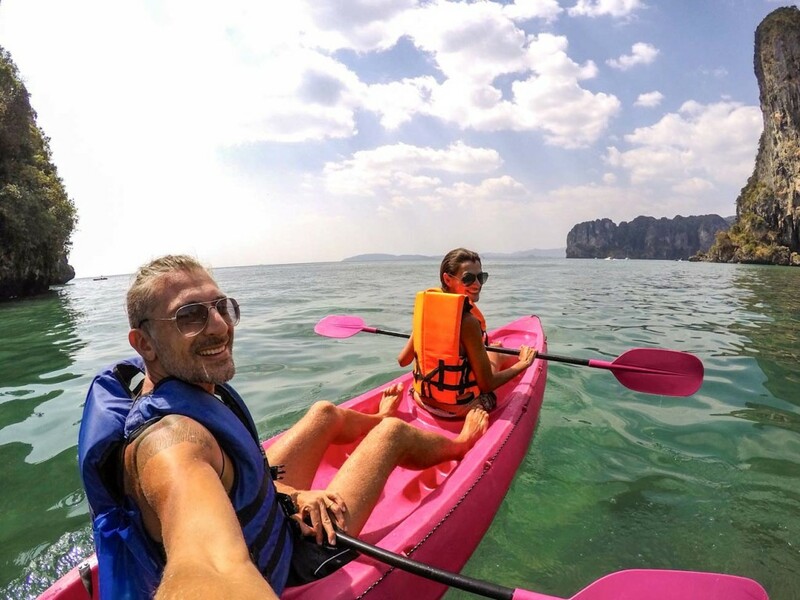 Travelers come to Thailand for different reasons, to backpack and learn about the culture, to party, for learning yoga, searching for the best cosmetic dentist, to relax or to work as a digital nomad. Doesn’t matter if you fit in one of these groups or if you are traveling to Thailand for any other reason, just keep in mind that if you plan your travel budget you can save a lot. Now let’s go back to the important question: How Much does it cost to travel in Thailand? On our Love and Road style, it cost less than 30 usd per day per person. Great isn’t it?! We gonna break down our 8 months traveling costs in Thailand and prove that you can have a pretty good life in the Land of Smiles! Keep in mind that all the values are in Thai Bath, by the end of the article we’ll convert the totals to US dollars. Also, most of the prices are for two people. We separated the costs of travelling in Thailand by groups such as the cost of accommodation in Thailand, cost of transport, food, night out… More than sharing our personal expenses, we’ll give you a general idea of the price of travelling around Thailand and some useful tips to make the most of your travel budget. How much does transportation cost around Thailand? Arriving in Thailand: If you are flying from outside Southeast Asia it’s very likely that you gonna land in Bangkok Suvarnabhumi International Airport, if you are coming from neighbor countries you might arrive at Dom Muang Airport. Flying in and out Thailand is not cheap, especially if you are coming from Europe or America. So before booking any flight to Southeast Asia I recommend you to check Skyscanner for the best deals, also create an email alert so the website will message you when the fares for this specific destination are going down. Another great tool to find cheap flights to Thailand (and everywhere) is Kiwi.com. If you are travelling around Southeast Asia, you can fly with low-cost airlines. Bus and trains are also good options if you are coming from Malaysia, Cambodia and Laos. Just be aware of the visa issues and scams on the borders. Many nationalities can enter Thailand visa-free at no cost. For others, there is the option of getting a visa on arrival or arranging one in advance from a visa or embassy. The costs vary. Later on this year the Thailand visa online will become available and it will simplify the process of applying for a visa. Price of transport inside Thailand: The transport inside Thailand is simple and organized in a strange way, but it works! I love the “joint ticket” where you can book a Flight+Bus+Boat altogether, or Bus+Boat+Tour in only one ticket. The joint tickets are perfect for travelling to the Thai islands for example, Bangkok to Koh Tao, with one company you can book the bus & boat to the island, only one ticket, one price and with the timetables synced. Many islands don´t have airports, so for us the easiest and best way is the night-bus + boat. You save time travelling at night. You can buy the tickets from travel agents, at the bus/train stations or online at 12Go Asia. Transport in the cities: In Bangkok the public transport works well. By Metro and Skytrain you can reach most of the tourist attractions and get around the city. In small towns and on the islands the transport is based on tuk-tuk [a three-wheeled vehicle that works like a taxi] and the songthaews [a red truck that transports people from one site to the other, kind of a bus]. The price of the tuk-tuk rides and songthaews are always negotiable and don’t feel shy to bargain. For the traditional taxi, ask for the meter, if they don’t want to use the meter don’t accept, just leave the car and try another one. Songthaew ride: 20 Bath in small cities, 60 Baht in Bangkok and 100 Bath in the islands. Tuk-Tuk ride: 100 Bath in small cities, 200 – 300 Baht in Bangkok and the islands. We spent on local transport: 17,434 Bath. The total costs of transport in Thailand [urban + intercity]: 40,769 Baht, for two people travelling in Thailand for 8 months. How much does accommodation cost in Thailand? You can find accommodation in Thailand for all types of budgets, tastes and locations. As I told you before, we love a good and simple beach hut, but also we can´t resist to a modern room with rooftop swimming pool in Bangkok. Bear in mind that you can find very cheap hotels in Thailand, but they will be very simple and basic, sometimes a bit dirty and not well located. The rule “You get what you pay” works perfectly for accommodation in Thailand! For us, the best websites to search/book hotels in Thailand and in Southeast Asia are Booking.com & Agoda. Bangkok has an overwhelming amount of hotels, hostels and Airbnb apartments [click here and get 20usd credit when you sign up]. When we want to pamper ourselves we stay at Amari Watergate. It´s in the heart of the city, has everything you expect from a luxury hotel in Bangkok for an affordable price [and free happy hour buffet of food and drinks]. For accommodation in the Thai islands the rule is very simple: cheap rooms are with fan and cold shower, the middle range comes with A/C, hot shower and sometimes breakfast, the luxury hotels are TOP!! If you are looking for an Island Extravaganza, check our suggestion for Phuket, the hotel we stayed is to die for! If you do a good research you can find hotels that are really great value for money. Don´t think that hostel and guesthouses are always the cheapest and smartest option. For example, in Aonang we stayed at Alisea Boutique Hotel and the investment was totally worth. We had the best location, a few minutes from the beach with many restaurants and street food around the corner. Plus an infinity pool with sunset view, delicious breakfast and a spacious room in Mediterranean style. Total = 64,337 Baht on accommodation in Thailand for two people during 273 days. An average of 117 Bath per person per day! 🙂 Happy days!!! Thai Food: love or hate it! It took us a while to get used to the spices, but now we love it! We also love street food, what means our expenses with food is small comparing with travellers that only eat western food while travelling in Thailand. If you go local, food in Thailand is very cheap [and delicious]. Western food [burgers, pizza, English breakfast…] are more expensive, even though still cheap if comparing with European prices. Thai Top Restaurants: Dishes start on 200 Bath. Western Restaurants: Pizzas & burgers will set you back on 150-350 Baht. Top Western Restaurants: Expect to pay around 600 Baht per dish in a trendy restaurant. The famous Pad Thai will cost you 50 Bath on a street stall, spring rolls 10 Baht each, coconut water 40 Baht and a beer on the supermarket as from 60 Baht. How much we spend on food in Thailand? Total= 138,900 Bath, an average of 254 Baht per person per day [at least 4 meals a day]. Eat everything! If looks good and smells good, go for it! During our 8 months living in Thailand, we got sick only once. Some food stalls look very dirty, others more clean and organized, have a look around before sitting and open your mind [and stomach] for a feast of flavours. If you have food allergies be careful, especially because they love to mix seafood with chicken, pork… Only drink mineral or filtered water! In many towns, you will find machines that sell water by litre [1 cent of Baht per litre]. It’s safe to fill your bottle there, we have been doing this all the time, and we are still alive! How much is the cost of attractions in Thailand? 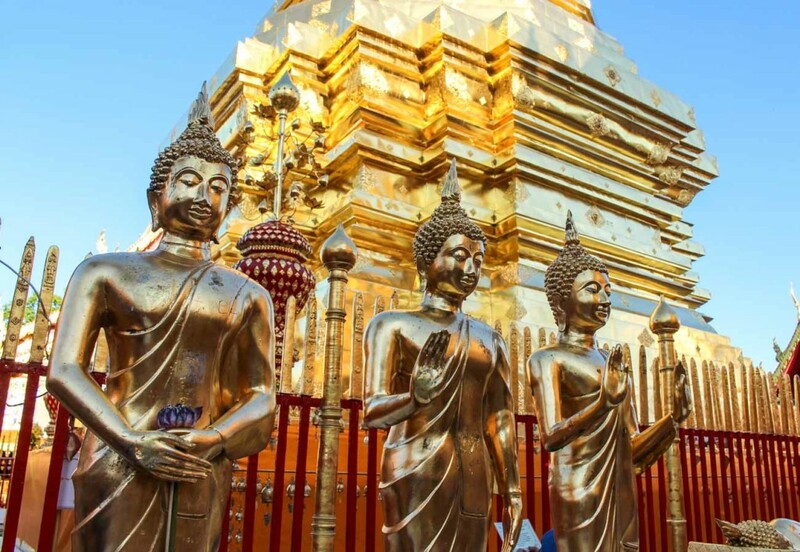 First of all, let me explain what attractions in Thailand mean to us: any place you can visit that somehow it’s interesting, tours, boat trips around the islands, snorkeling tours, entrance fees and tips to the Buddhist temples. Attractions in Thailand are not expensive! Many temples and museums are for free, and others [like Grand Palace and Wat Poh in BKK] are very affordable. On our travel budget the most expensive attractions were the boat trips we did around the islands like Koh Phi Phi, Koh Tao and Krabi. The secret for saving some money on the tours is to check the price with different tour operators and bargain. You can also book tours online, TakeMeTour has an extensive selection of tours with Local Experts. They are locals who knows everything about their neighbourhood. We had amazing experiences with them, like discovering unique coffee shops in Bangkok, watching the sunrise in Phuket and cooking Pad Thai with a 85 years old grandma. We spent on attractions in Thailand a total of 11,590 Bath, what means 5,795 per person. No regrets here! Every penny invested on cultural or beach activities were worth. Thailand has such a unique culture that sometimes you will need a guide to give you a better understanding of the place. Or to have unique experiences, as the coffee roasting and mountain trekking we did in Chiang Mai, north of Thailand. Talking about attractions, don’t forget to go out of the beaten path. Thailand is rich in culture, and there are plenty of things to do and see there, for a moment leave your guidebook aside and try new things. We discovered cool things to do in Bangkok, follow our tips and go to places that are out of the tourist zone. As much as we travelled inside Thailand, we didn’t cover all the spots, neither all the attractions. After reading our post, if you still need more tips about places and attractions, check the this Explore Guide to Thailand. How much does a night out cost in Thailand? Well, nightlife in Thailand can ruin your travel budget! I need to tell you this because night out is our biggest expense in Thailand. I know, we shouldn’t go out and drink so much, but we can’t help ourselves… Thailand is known for the wild nightlife and the girls bars. Bangkok night scene and the Full Moon Party in Koh Phangan are the best bet if you want to dance and drink. We had done both and we love it! Bangkok nightlife has everything you can imagine, for all tastes, pockets, legal and illegal, it´s your choice and your risk! The upscale bars are TOP, most of them have dress code and expensive cocktails. The middle range and local bars are unpretentious, you can have great fun for a decent price! The best areas for bars are: Sukhumvit, Silom, Ekamai and RCA. Khao San Road is a different world! People say it is full of backpackers, dirty bars and cheap drinks… Don’t forget to add us to this list, because we love Khao San Road. There you need to mind what you drink and be open mind. Go for the fun and dance your socks off! We recommend Best Bar in Khao San Road, safe alcohol buckets for a fair price and great electronic music by a Thai Dj. If you go there tell BIG the Dj, and Nut, the beautiful Thai girl behind the bar, that we sent kisses! Here is a video from our favourite street bar at Khao San Road! We are not talking about the striptease & ping-pong shows because the price and the style of the clubs vary a lot. I would recommend you to always double-check if it´s a safe place with fixed price and friendly atmosphere. Never go inside without knowing how much you have to pay and all the rules. Your scam alert must be on! The Full Moon Party in Kho Phangan is great fun too, very mainstream and full of drunk /crazy people [including us]. Not my favorite party in Thailand, but if you are travelling around the islands and want to try something different, go for it! Be aware of drink poisoning, check the alcohol you buy and ask for sealed bottles. We also have a video about our Full Moon Party and Rob playing with fire! Now the final question: How much does it cost to travel in Thailand? Not much! If you go for budget options and do a backpacking trip around Thailand, your money will stretch a lot, even with some serious party! Even a luxurious trip in Thailand won’t cost a fortune, comparing to European and North America prices, the best of the best in Thailand is cheaper. How much does it cost our trip around Thailand? We spent on 273 days [8 months] travelling in Thailand a total of 356,484 Baht. Our travel cost in Thailand per day, per person was 635 Bath. We spent less than 20 usd dollars per day per person. Well done!! Of course, we saved a lot on accommodation by doing the house sitting, but the secret is to plan well and spend your travel budget wisely. If you are on the saving mode, I’m sure that even paying for full accommodation you can manage to travel around Thailand for less than 40 usd per day. However, if you want to go for the luxurious side of Thailand, then the sky is the limit! On the post we talked about costs of travelling in Thailand: food, accommodation, transport and activities. As we are digital nomads, there are a few other costs of living abroad that we can´t add to the travel list, so we create a new section: the cost of living in Thailand! 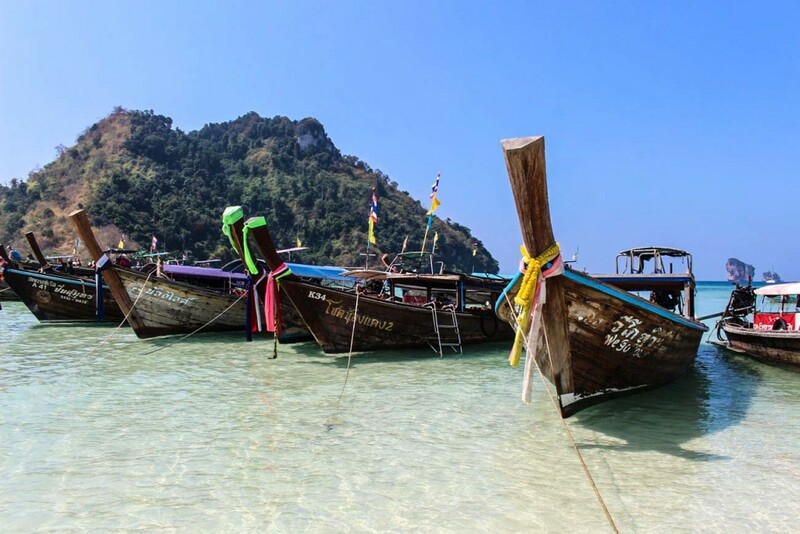 Thailand is one of the favourite destinations for nomads and digital entrepreneurs. The weather is great, the food is delicious, the beaches are paradise and the cost of living in Thailand is cheap. Bangkok is the home of expats and executives. Chiang Mai is the address for the digital community. Do you want to know why digital nomads love Chiang Mai? Read our post about it! Extra cost of living in Thailand = 91,723 Bath for 2 people during 273 days. A total of 168 Bath per day per person! If you put together the costs of traveling in Thailand plus the costs of living in Thailand we get a total of 448,206 Bath, breaking in 273 days and by two people we got a final amount of 820 Bath! That is roughly 24 usd dollars per person per day around Thailand! A pretty good deal! Pin it! Save all this info for later! Hope our article about how much does it cost to travel in Thailand helps your to plan your trip. If you have any questions leave a comment, we love to share money saving tips! Do you think we manage well with our travel budget in Thailand? PS1: For more suggestions on how to plan a trip, book flights and hotels have a look on our Travel Resources page! PS2: Our Thailand travel cost does not include the inbound & outbound flight. The price of the transport will change depend on where you are coming from and your next destination. PS3: We didn’t add the price of our travel insurance because its is a worldwide yearly coverage, and the price for this policy is very different from a month/weekly insurance. We use World Nomads and we are very happy with them, check the prices and buy your insurance here. Thank you for sharing the cost for your trip to Thailand. I plan to visit Thailand, especially Phuket this year. You can have a great holiday in Thailand without spending a lot! Food in Phuket is a bit more expensive than Bangkok or Chiang Mai, but totally worth a visit, the island is amazing! Happy Travels and thanks for your comment! Have a great time in Thailand, it’s a beautiful country with lovely people!! Best article on Thailand I’ve stumbled on so far. I’d suggest bolding the important info along the article, or underline or something, just make it more visible, you know how we all suffer from ADHD these 🙂 Other than that, great piece, happy travels! Glad that you like the article, we know it’s a bit long… But lot’s of information on it! Thanks for the tips, will keep them in mind for our next post! Great article. I just arrived in Bangkok yesterday. I was just looking for this kind of info. I have one question tho. What did you do for visa? I’m currently here with tourist visa so I can only stay for a month. I’d like to be here at lease more than 3 or 4 months. Again, thanks for your great insight. The Visa is a common issue for most of the traveller here in Thailand. We have Brazilian passport so we can stay 3 months as a tourist in the country. If you have only 30 days visa, what most of people do is an extension of the visa for more 30 days or a visa run. They go out Thailand (Malaysia , Myanmar or Cambodia) and back in a few days, so they receive a brand new visa. The law for Thai visas changed this year, I know there is a 6 months visa now, but not sure how it works, you must check on your embassy website. Come to Thailand, it´s a stunning country!! Can’t wait to go to Thailand myself this year! Great budget article, guys. So amazed that you spent so little. You can have tons of fun in Thailand without going bankrupt!! Enjoy your trip to the Land of Smiles, thanks for stopping by! I was told often it’s quite cheap. Very informative post. 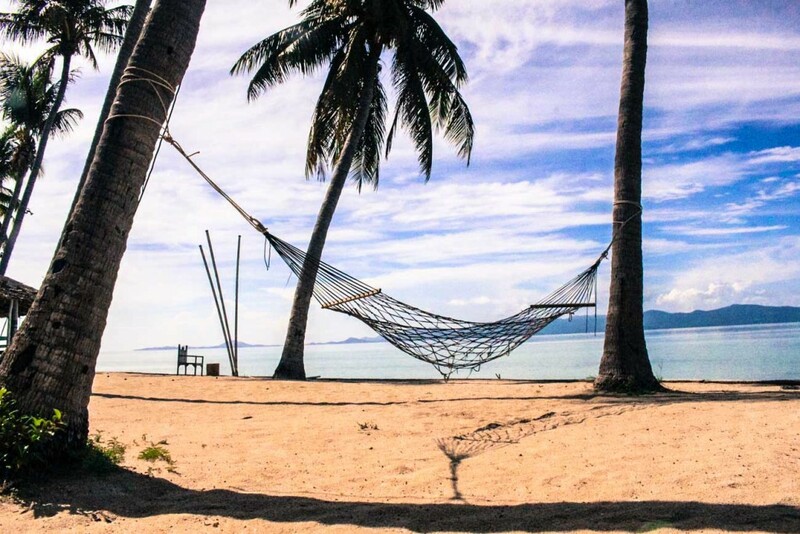 I guess travel to Thailand is doable even though it seems so far away…it’s always been on my to-go-to-list…great post..
You should come to Thailand, it´s a incredible country. Apart from the flights, travelling inside Thailand will make no harm to your travel budget. That’s so super helpful! I’m actually planning to visit a friend in Thailand (if possible next year), so I’ll definitely bookmark this article here. Glad to know that you found our post useful! And don´t wait too much, go and enjoy Thailand, it´s beautiful! Awesome breakdown guys! Enjoyed watching your video on Khao San Road too hehe >< Was awesome seeing you briefly in Chiang Mai. Keep on being awesome! Was great to meet you in Chiang Mai, that city is special, and budget friendly! A great guide for anyone looking to travel slow in Thailand. Yet another great piece of information. Very well detailed and informative. I think you guys did an amazing job managing your finances while in Thailand. It already shows a lot of experience! Overall I think Thailand is a great place to visit and not on the expensive side. We are very organized with our budget, since we started travelling , almost two years ago, we keep track of all our expenses. Thanks for your positive feedback! I will definitely never travel on 20 dollars a day in Thailand again, but I have. Consistently, whether you want luxury or cheap bungalow down the road from the beach, Thailand is a fantastic bargain. You pointed out some great things to do as well, it’s really a country for any budget. Totally agree with you Carol! Thailand is a country for any budget, and even spending 20 usd per day you can enjoy a lot, on a simple style of course!! Great post! It depends so much of the lifestyle of each one, I agree. Next time I am in Thailand I would love to do housesitting as well. I am sure that’s a great experience. Thailand is just a great country…I miss the people! Everything is so easy-going. A Thailand is an easy-going country, spot on!! House sitting is great specially if you get one in Bangkok or in one of the island… Perfect summer holiday! WOW I love your photos for starters!! And this post is very useful considering I’ve always admired Thailand from afar, this is couching me to get on that plane and do this already! Come to Thailand, no doubt you will love it! It´s such an interesting country and the perfect place to enjoy and relax! We never had any problem Scott. We heard many stories of people that get robbed, but never happen with us. I think is because we are very careful, we never leave our backpacks unlocked, our valuables are always hidden. Bottom line, we don´t take the risk. In this two years travelling around the world we never trouble with people stilling our things. Thanks God! This makes my dream of traveling there so much bigger!! I hope to make it there some day. Great piece. Was stunned how cheap everything was in Vietnam too. How does Thailand compare to there? For us Thailand is cheaper than Vietnam, especially because in Thailand everything has price tag, different from Vietnam where they make up the price according with the tourist face. But the Thai Islands are more expensive, accommodation and food. Great post Natalie! Really comprehensive and detailed post. Thanks for such a complete and detailed breakdown of Thailand travel costs. As you correctly point out, these costs are just a range, depending on what you want to do and where you want to go. You folks went about everywhere and saw almost everything! That is why we love long term travel too! We spent a bit less in Thailand because we don’t go to bars much and keep our “attractions budget” to a minimum. Thailand is a great value for budget travelers and a very interesting country. We have so much fun here that every penny was worth it! Wow… a lot of great information on this site. Has anybody here ever taken the train from Bangkok to Chiang Mai? How much was it? Can anybody recommend a hotel in Chiang Mai that is inexpensive? Thanks for any advise you have. We did this trip twice on the night train, it was something around 700-800 baht per person. Easy to find inexpensive hotels in the old town, Nuampranee Guesthouse has double rooms for 350 baht. Great guide you guys! To bad Thailand is getting more and more expensive. It’s getting more expensive, but even though it’s affordable and a great destination! Very useful information here. I am so lucky to find this blog. Actually next year I will go for holidays to Bangkok with my family. Before going to our trip, I wanted to know something about Bangkok and I got it. Thanks a lot for sharing these tips. This seriously makes me want to visit — living in Europe, I can’t believe these costs! The breakdown is also really helpful. Also interesting to read in the comments how you handled the visa — I think that’s the big open question for a lot of us looking to head to Thailand. Thanks for your comment! Thailand is cheap, especially compared with Europe. The Visa is always an issue and since the beginning of this year the government in Thailand is getting more restrict with visa runs, so if you plan to come here apply in advance to avoid any hassle. Fantastic article and indeed very useful.. Travelling to BKK in another 2 days for a 5 days vacation. With family though.. Hope i would be making worth a trip with family..
Bangkok is an awesome and diverse city, I’m sure you gonna find fun and interesting activities to do with your family. 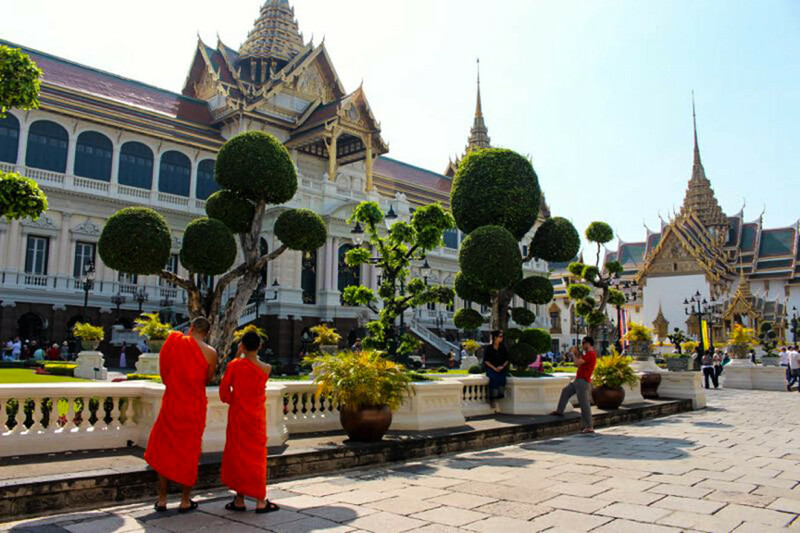 Have you checked our post about Bangkok? We have some great travel tips to Bangkok, and also a second post with unique and different things to do in town. A very informative post! I’m pretty sure this still helps a lot of travelers plan their budget until now. Thailand was a blast and is definitely budget-friendly. I hope travelers planning to visit Thailand soon find this article, this would totally help them out plan ahead and not get into any tourist traps! The idea is to help people to travel more and better, see the best of Thailand. This is so helpful guys. When I was planning for my thailand trip initially, the budget seems to go much beyond what you mentioned here. But then, I guess I can go back and apply some of the tips you mentioned here. 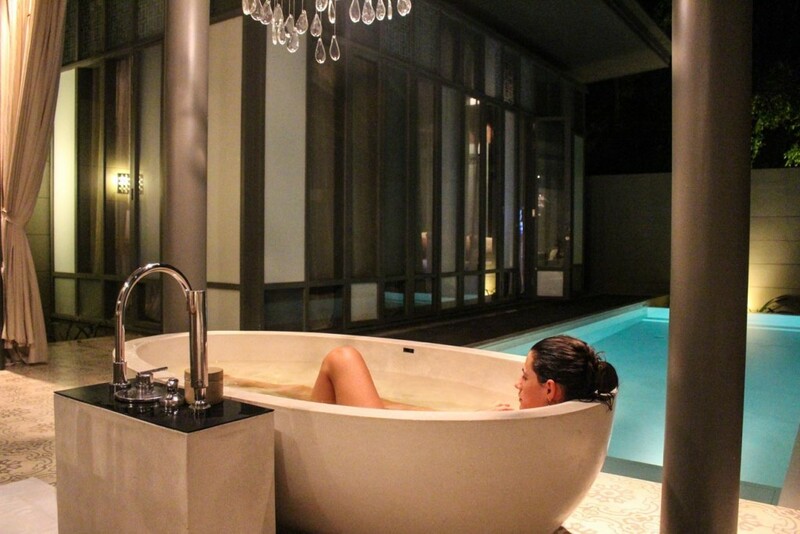 House sitting seems to be very popular in Bangkok and that seems like one of the sure shot ways to save a lot here. House sitting is great, you can save a lot on accommodation and stay in a nice a place. As you said, in Bangkok there are plenty of option! I’m going to Thailand and other South East Asian countries soon, and I’m so glad I came across this article on Twitter. It has really helped me budget what I might expect to spend and how I should travel. I was also really intrigued by the thing you mentioned about house sitting and taking care of a dog, that sounds like a great deal. Will read about that next. Welcome to Love and Road! Traveling in Thailand is a great experience and also a cheap one. You can do a lot there for less! Thanks for your great information. i’m leaving to thailand this weekend with tour. Now i know how much spending money i should bring with me now. Hi, we will going to visit bangkok next month, how much we will expect to spend for 4 days. It depends on your travel style. The above article mention the average costs of accommodation, transport, attractions and food. You can have an idea on how much you will spend. Brazilians get 90 days Visa on arrival. We planned some 1-2 weeks trips outside Thailand before our Visa expires, when we return we were entitled to more 90 days. We like to be on the safe side so we always have an onward ticket. We area group of 5 guys from India traveling to Thailand in the last week of March. We have decided for 2 nights Bangkok, 1 night Krabi and 3 nights Pattaya. Are the above periods sufficient to explore each of these locations or would you suggest a different itinerary? Sounds like a good itinerary. I’m traveling with my partner in April 2018 to Bangkok, Chiang Mai and down to Koh Tao for scuba diving. We have booked a week during Songkran in Chiangmai and another week with the dive operation in Koh Tao. I have heard the tourism is out of control now so I am worried if we don’t book will we be able to find accommodation still? We always like to book our accommodation at least a month in advance. In Asia usually Agoda has more hotel offers than Booking.com. Thank you for sharing such information. Is it possible you could send me more information in how you obtained tickets for transportation in Bangkok to islands what’s trust worthy places to stay I would greatly appreciate it for extra information. Your hotel can easily arrange it or you can book online at 12GoAsia. One small point. You do not mention dockless bikes as a means of transport. Here, in Chiang Mai, they are becoming increasingly popular and are a really cheap and environmentally friendly way of getting around the city. The two main companies here seem to be ofo.com and mobike.com and bikes can be found almost anywhere as shown in the relevant apps. It wasn’t an option at the time. Good to know that now they are available. Thank you for the very detailed article, with all the nuances included. Thanks for sharing this. It is very resourceful and so much helpful as I travel to Thailand tomorrow.